InterNations Nashville - Everybody Was Kung Fu...Eating! 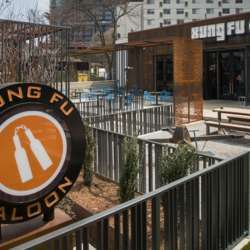 Kung Fu Saloon has fun atmosphere that will entertain everyone! Come join us for a bite to eat and then let the games begin. There are 18+ vintage arcade games like Galaga, Centipede, Ms. Pacman, NBA Jam, Mortal Kombat, Golden Tee, Big Buck Hunter and plenty more. The fun continues with shuffleboard, foosball, ping pong, ALWAYS FREE skee ball lanes, Giant Jenga, Giant Connect Four and board games. There should be plenty of street parking in Midtown and also paid parking lots all over.